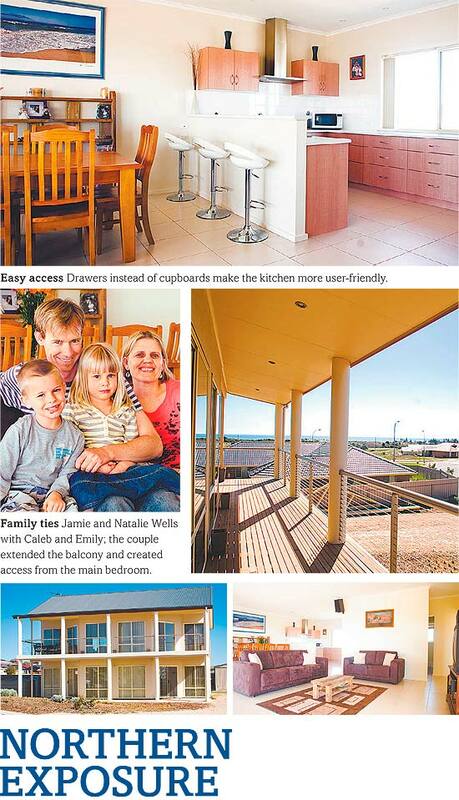 For more articles on the Streeton 2 Storey please use the menu on the right. With the Living areas upstairs and children's zone beneath, the Streeton turns conventional design on its head, and that's just what Jamie and Natalie Wells were looking for. "We wanted to have panoramic views of the sea from the Living areas as well as benefit from the natural heat of the northern sun," says Jamie. "In winter we get the full sunsets while in summer the sun is to the side so you can see it from the balcony but it's not in your face." Views and Light are made the most of across the front of the home, which has expansive windows and walls that angle outwards to provide extra space and views in all directions. Upstairs features the open-plan kitchen, living and dining area, with the main bedroom, walk-in robe and ensuite to one side. The stairs and separate powder room are hidden from view by a small wall. Glass sliding doors lead from the Living area to a full-length balcony. In the kitchen, the couple added more bench space and a wider entrance and placed a window on the back wall to provide views of the backyard and hills. "The big kitchen is wonderful. It has lots of drawers instead of cupboards, which works really well," says Natalie. "Plus it's close to the dining and living area, so you never feel isolated." Downstairs is reserved for the children -Joshua, 14, Caleb, 7, and Emily, 5. With four bedrooms running off the Large, central rumpus room, there's ample space for everyone. Also on this Level are the laundry, storeroom, stairs and main bathroom, which is discreetly tucked along the rear wall. A bonus of having this area downstairs is the noise doesn't carry upstairs. "It's a very unusual design and we really Like the way it uses the space," Jamie says. "It doesn't waste any space with hallways and the Living area feels so open, it's nice and bright." For more information about the house in this story please look at the Streeton two-storey.